Chillington Tools >> Digging Hoes & Handles >> Set of 3 Small Digging Hoes. Hoe Head No.1: 140mm x 75mm weighing 294 grms. Hoe Head No.2: 125mm x 100mm weighing 330 grms. Hoe Head No.3: 180mm x 100mm weighing 376 grms. wooden handle 890mm (35") Please note all sizes and weights are approximate and may vary. 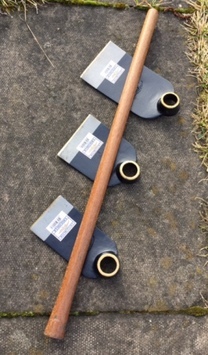 Chillington Tools offers you the ultimate in Set of 3 Small Digging Hoes.s as well as a full range of other Digging Hoes & Handles available online.